As Indiana State University officials discussed a proposed area of study with state education officials last March, they had an unexpected ally: the Indiana Department of Transportation. Kim Pearson, deputy commissioner of human resources for INDOT, touted the benefits of the then-proposed bachelor's degree in civil engineering technology at ISU to the Indiana Commission of Higher Education, which later in the meeting approved the program. Pearson's presentation was an element of support ISU received from the state agency in creating the major, which is the first four-year degree in civil engineering technology to be offered by an Indiana public university. 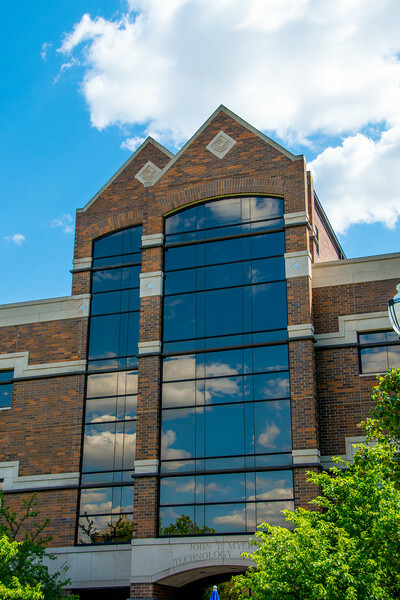 As ISU officials were creating the new civil engineering technology major, they contacted INDOT and the Asphalt Pavement Association of Indiana (APAI) for support and insight as to how the new area of study could benefit the organizations. "As an agency responsible for building and maintaining Indiana's infrastructure, civil engineering is a core competency for INDOT," Pearson told the commission. "The civil engineering technology degree will create an additional source of candidates with technical and managerial skills necessary to fill engineering positions in planning, design, construction, operations or maintenance." The new program is different from civil engineering, which deals with mostly theoretical concepts and design; people with degrees in civil engineering technology work more in the application area, said Robert English, associate dean in the ISU College of Technology. Indiana State contacted INDOT after learning that transportation departments in other states frequently hired civil engineering technology graduates. "Our business is to provide value to businesses, government organizations and industries in the state of Indiana," English said. "When they articulate a need, then what we have to do is look at ways of meeting those needs within our areas of responsibility." The support ISU received was vital, since universities need to prove that a demand exists when they propose to offer new majors. Pearson explained to the education commission that the new program would provide students for internship opportunities at INDOT, which employs more than 300 engineers in a variety of fields. "It shows that a partnership between two public agencies can fill a niche and a need in the workforce," Pearson said, "for employers and for students." Indiana State also received support from the Asphalt Pavement Association of Indiana, which includes 75 contractors, asphalt services providers and other firms as members. William Knopf, the association's executive director, wrote Bradford Sims, dean of ISU's College of Technology, supporting the new four-year program. "As a general statement, our member contractors and our association support increased civil engineering education and construction management education by postsecondary institutions in the state," Knopf said. "Such education and training benefits our industry in the long run, makes our member firms more competitive and positions Indiana residents to compete and thrive in a global economy." While the organizations supported ISU's efforts to create the new four-year program, INDOT and APAI also were instrumental in providing advice about potential internships and employer opportunities that would be available. ISU faculty members also talked with INDOT officials and APAI representatives about the industry's needs as the program curriculum was finalized. "The support we received from the Indiana Department of Transportation and the Asphalt Pavement Association of Indiana goes to show how organizations can develop a partnership that can be mutually beneficial for all the parties involved," Sims said. "By working together, we have been able to create a program in Indiana that provides our students with solid employment prospects immediately upon graduation while simultaneously filling a niche for employers in the state that previously was difficult to fill." Several students have already enrolled in the program, which is being offered for the first time this fall. English and other ISU officials expect that more students will enroll in the major when they learn about the job opportunities that are available for people with a civil engineering technology background. "The whole career focus is much more prominent than it was nine, 10 years ago," English said. "The bottom line is that most students and their parents understand the notion of attaining a professional job and being able to make money rather than just getting a degree, then thinking about finding a job after graduation." 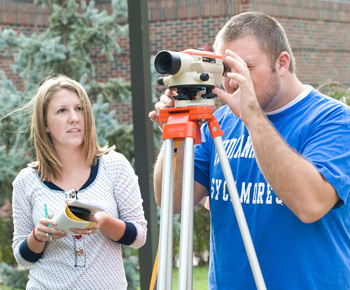 Photo: http://isuphoto.smugmug.com/Other/marketing/Survey-Class-Brochure/DSC8757Survey/399344703_TdRYP-L.jpg (ISU/Photo Illustration)Several Indiana State University students simulate using surveying equipment. 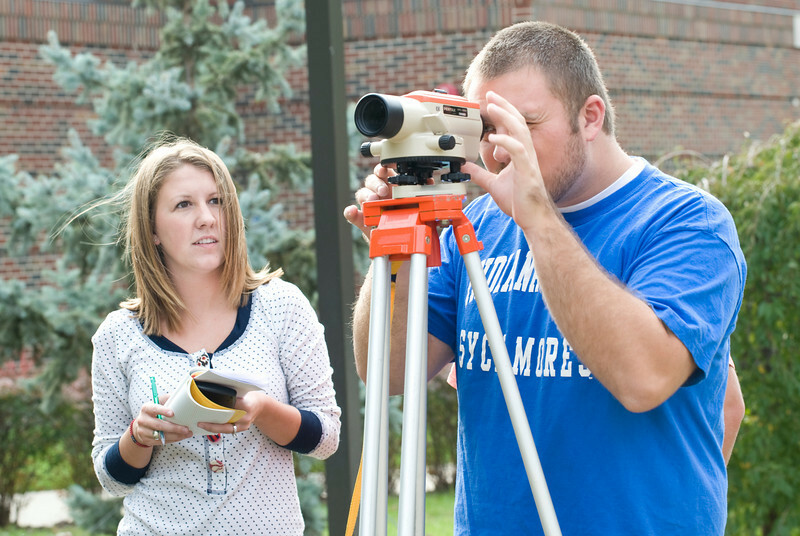 Students in the new civil engineering technology major at ISU will learn how to survey as part of the curriculum, which was developed with support from the Indiana Department of Transportation and other organizations. Photo: http://isuphoto.smugmug.com/Campus-Scenes/Campus-Scenes-2010-11/i-KhzF377/0/L/042312campusscenesspring-0661-L.jpgIndiana State University's John T. Myers Technology Center, which houses many of the programs in ISU's College of Technology. ISU officials received support for the new civil engineering technology major from the Indiana Department of Transportation and the Asphalt Pavement Association of Indiana.